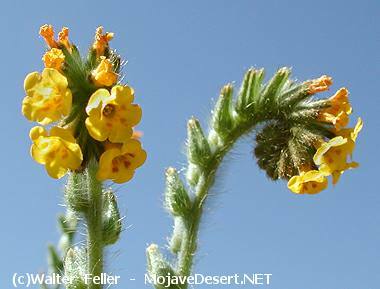 Small yellow-orange flowers growing on a hairy, generally bristly, weak stalk: up to 2 feet tall. Unfriendly looking plant with hairs becoming stickery as plant matues. Hairs irritating to human skin. 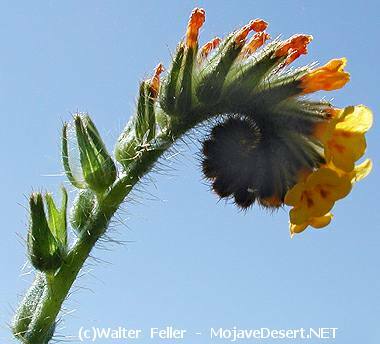 Fiddleneck common name comes from coiled fiddle-shape formed by flowers as plant blooms. Also known as Devil's lettuce. Found in disturbed, sandy and gravelly soils up to 6,000 ft. In springtime Indians would soften leaves from stalks before maturing and eat with salt as a source of greens. Seeds are toxic to livestock such as horses and cattle.